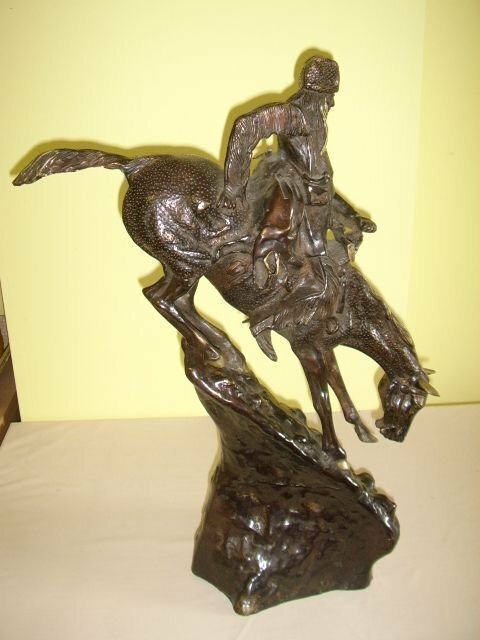 This large and heavy sculpture has been hand crafted around the early 20th Century and is produced after the famous original of 1903 by Frederic Remington. 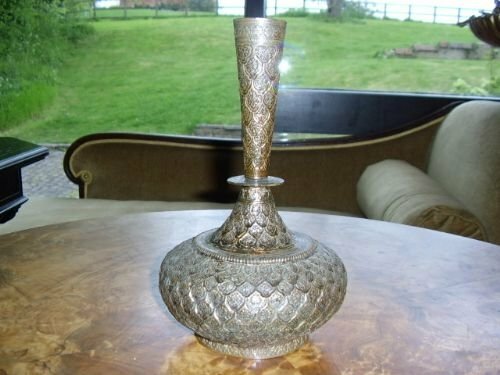 The detail is very good with a patina throughout being a dark metalic lustre,with some areas having been over dusted and looking brighter and cleaner. 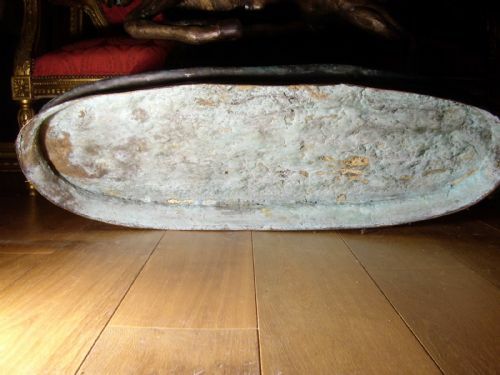 This bronze is a tremendous weight and would surprise most people when trying to pick it up. 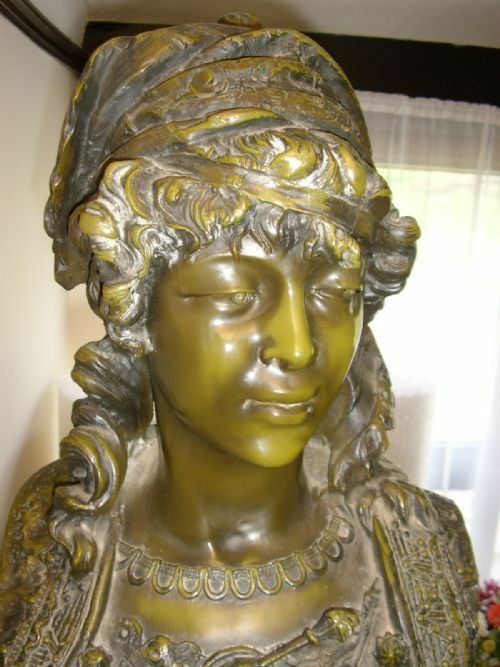 There should be a fine braided copper rein,but this is absent.This could easily be made and replaced. 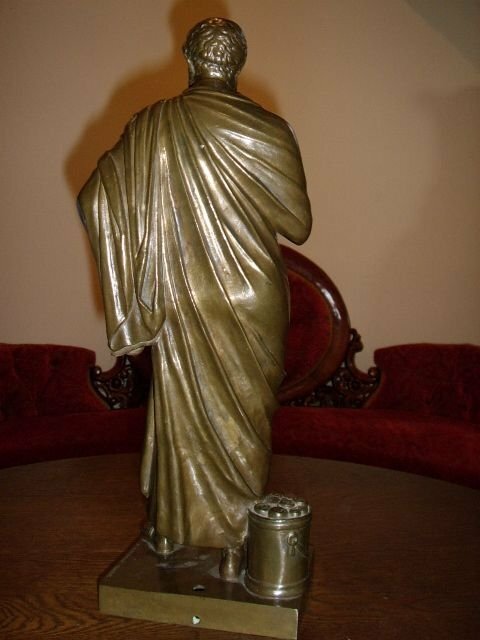 There is no damage at all or other missing parts. 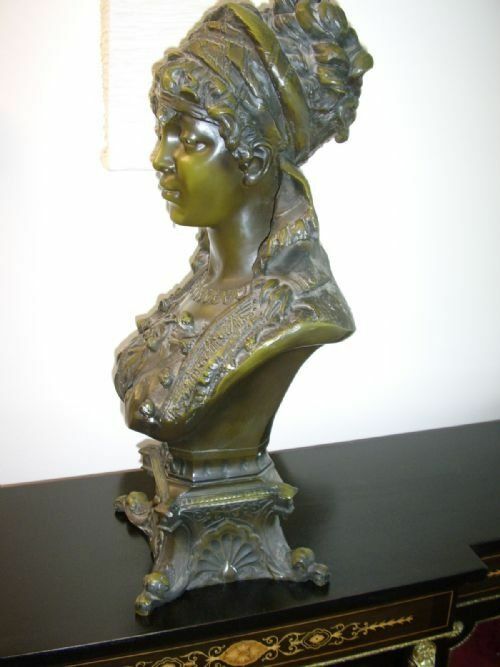 A beautifully modelled painted French Bronze Bust of a young maiden in the Art Nouveau style,and signed on the rear after sculpture Henry Wissen Senior. 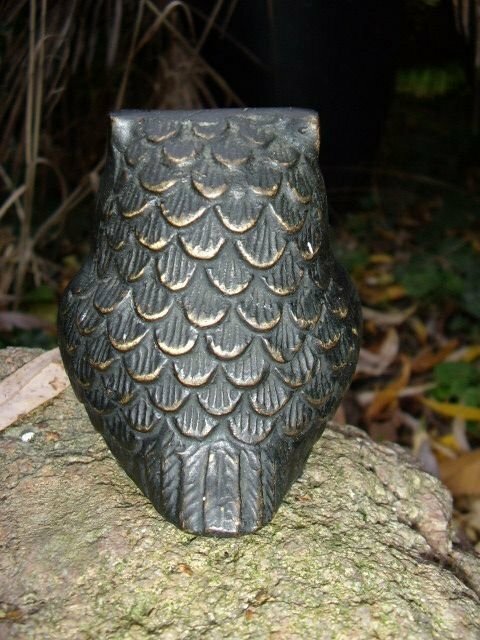 Presented all in one with a hollow cast lower decorative square plynth,supportred by four lion claw feet,and showing a raised shell design in the patterned support. 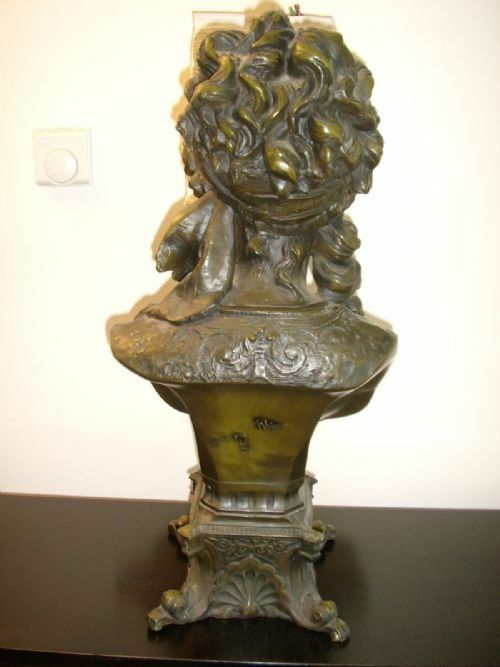 All in very good condition commensurate with age and weighing in at a huge 16.8 Kg. The green enamelled finish is all in good solid order. 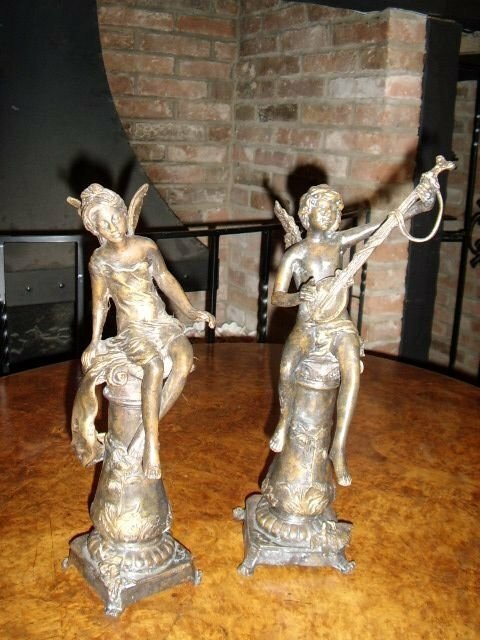 A quality pair of large bronze cherub musicians sitting on ornate seats having dolphin design supports,with one seen playing a vilolin and the other an horn. 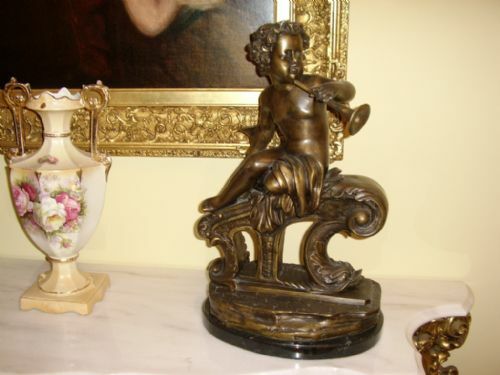 Good colour and patination with good attention to detail,both of considerable weight,and presented on a slab of black polished black marble with white veins. Ideal for standing on a large sodeboard or even down on the floor inside the fireplace. 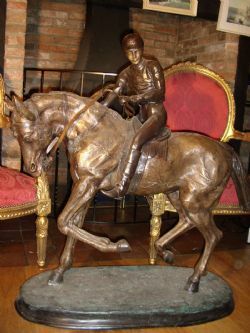 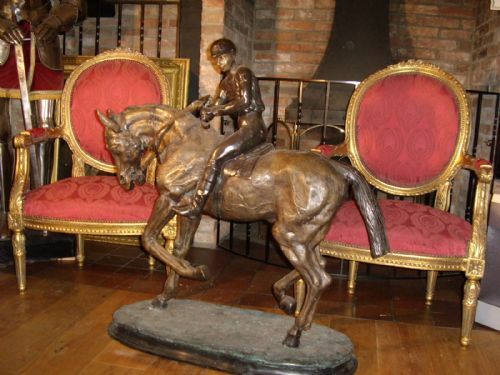 A good quality re-cast 20th century version of Bonheur,after the original work by Pierre Jules Mene,of this large scale sculptured bronze of a Jockey riding his horse in slow gallop. 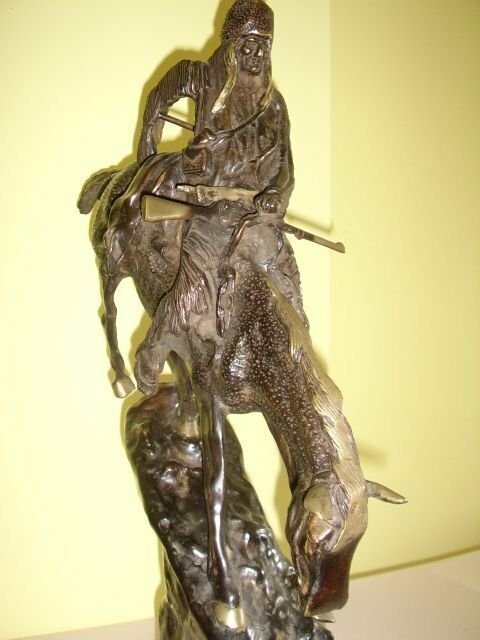 There is a nice colour pattination and good overall detail is shown in this piece. 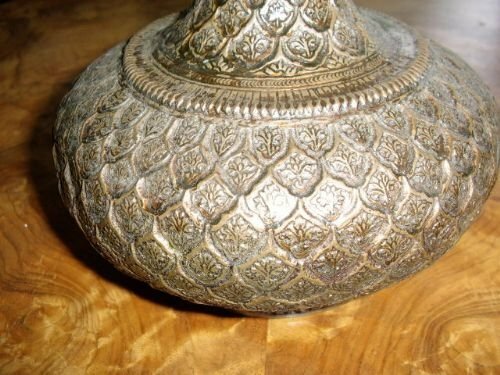 There are some tiny patches of green oxidation which require a brush off with a fine steel toothbrush,and then a careful waxing to preserve. 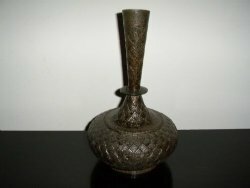 Condition is very good with a natural colouring and uncleaned finish. 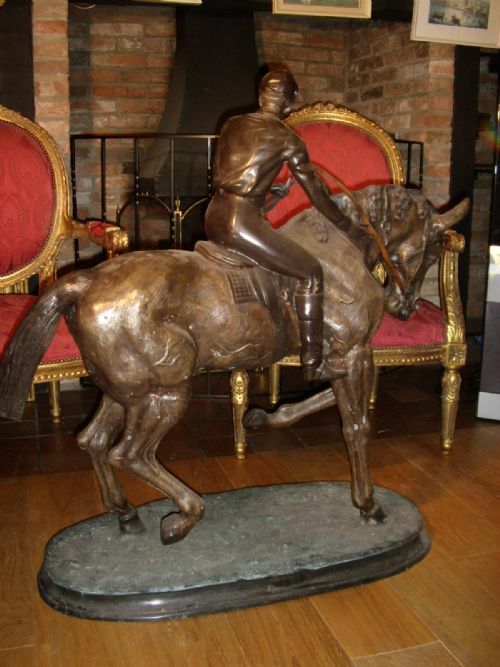 Delivery can be arranged by us.Quotes available may vary based on your location and insurance. 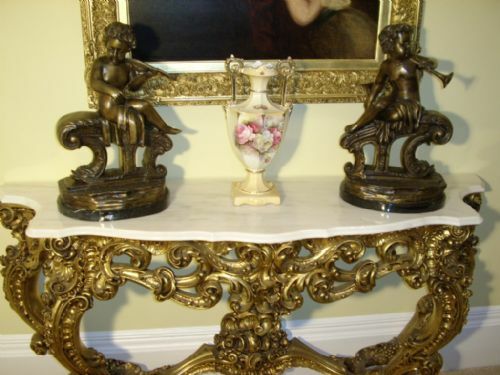 VIEWING BY PRIOR ARRANGEMENT TO SUIT. 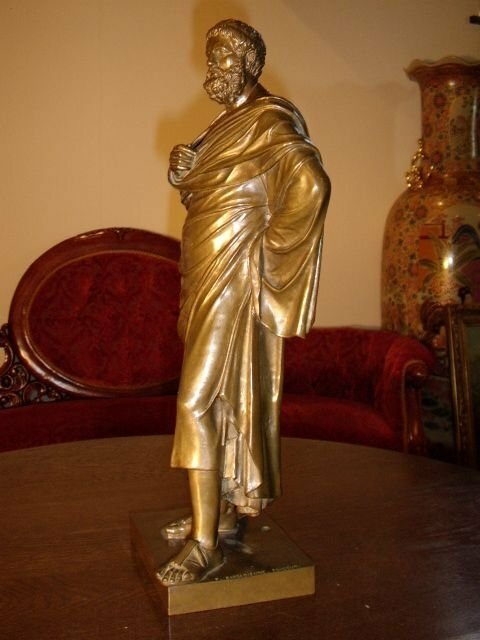 A fine Bronze Sculpture of the famous Greek Playwright Sophocles by F.Barbedienne Foundry in Paris and dating around the last quarter of the 19th.Century. 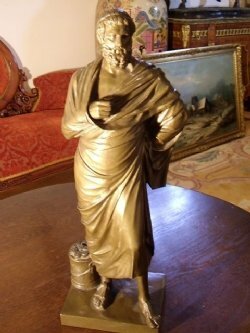 Sophocles was one of the most influential writers of ancient Greece.He was an Athenian from the deme (village community) of Colonus. 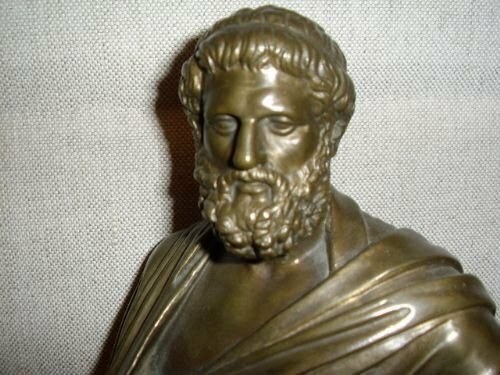 Whilst a famous Greek playwright and poet,he wrote 123 plays during the course of his life,but today only 7 survived in a comlpete state.He died in 404. 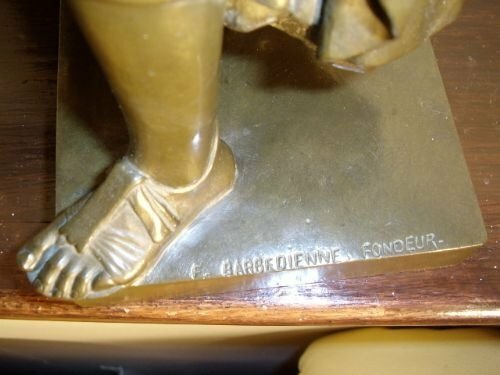 The base is clearly inscribed F.Barbedienne Fondeur,and depicts a beautifully modelled Sophocles wearing a toga. 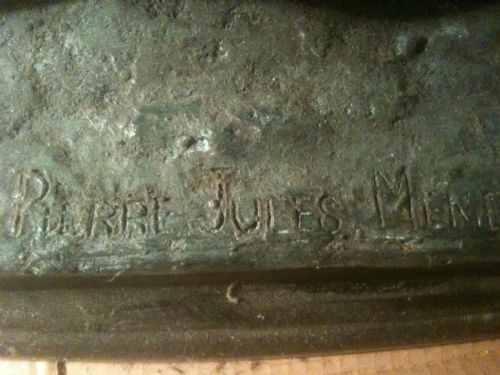 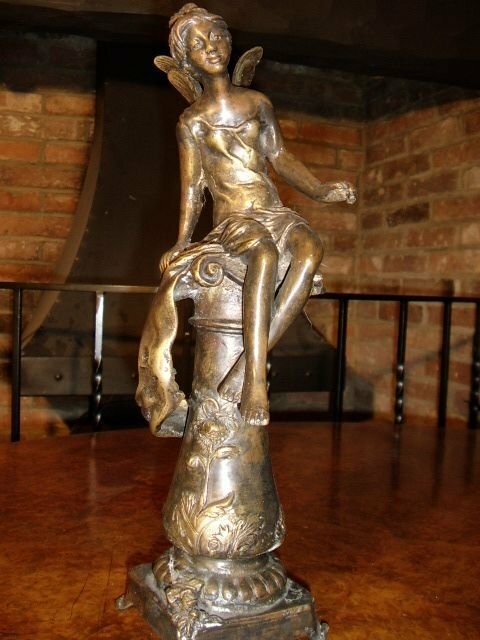 This bronze is in excellent condition and has a perfect patina. 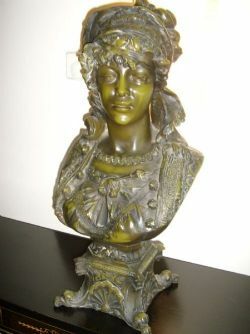 A sought after bronze by one the the finest french foundries who produced such works throughout the entire 19th century. 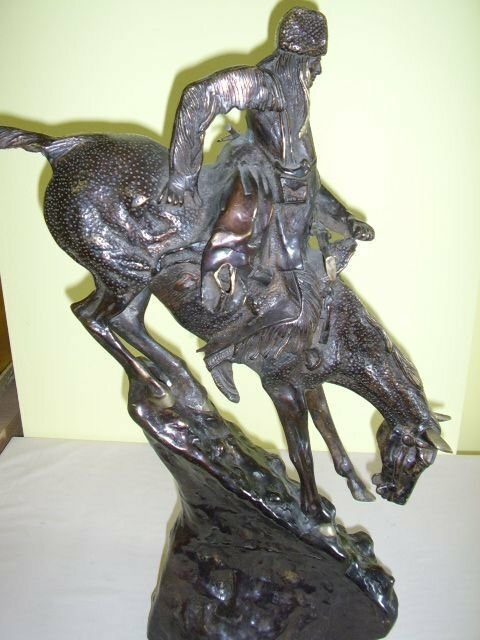 A very collectable and substantial sculpture making a fine investment piece for the descerning buyer. 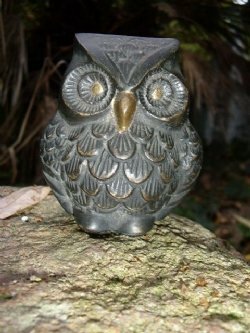 One of only a handful still surviving today. 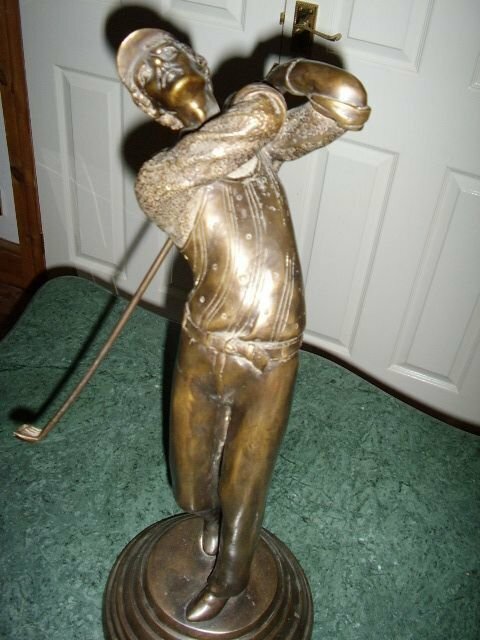 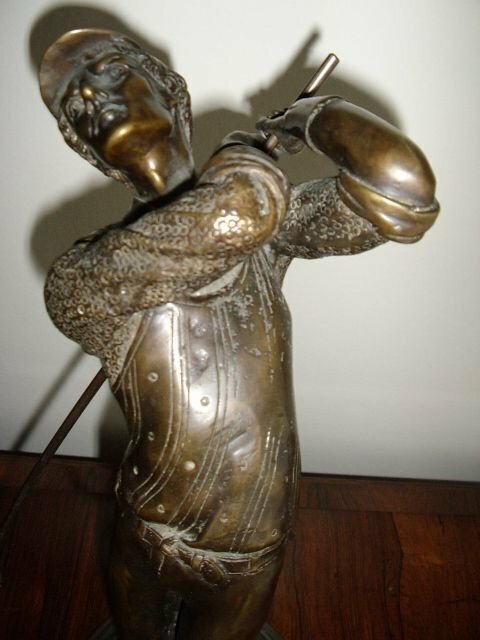 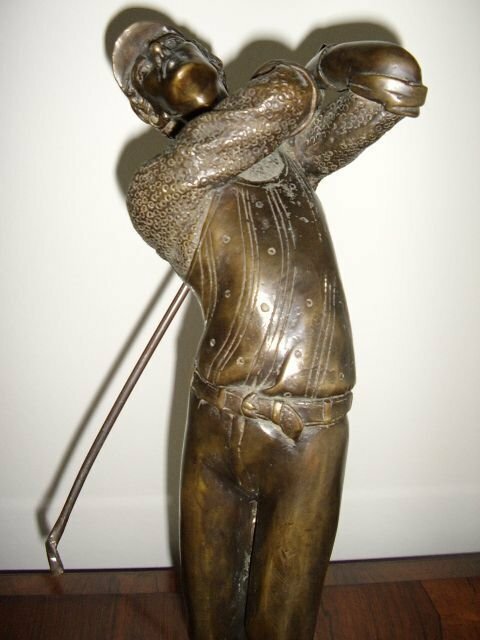 A very fine sculpture of a bronze golfer on the follow through. 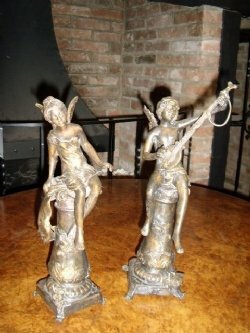 The figurine has been made with a detachable club and stands firmly on a round tiered base. 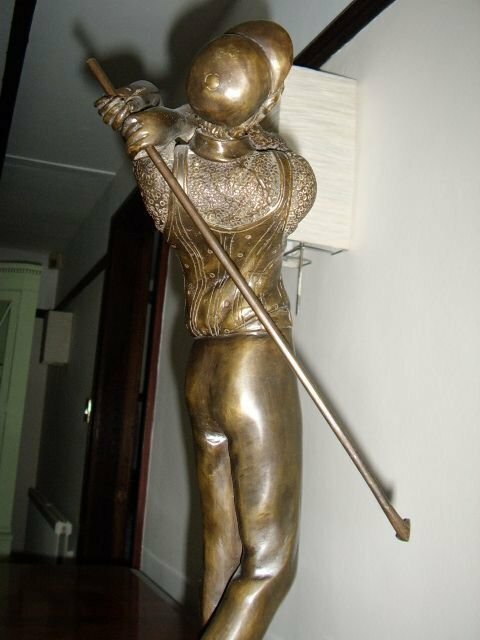 The Golfer stands approximately 21 Inches tall and is in perfect condition. 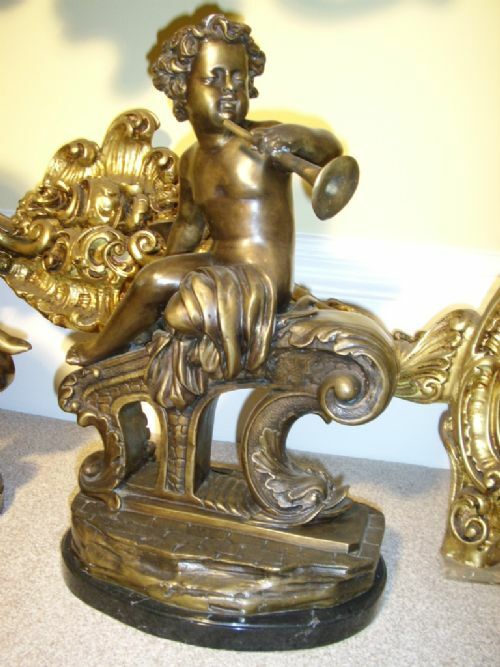 There is a good patina with the colour being uniform throughout with no signs of cleaning. A collectable and impressive golf figurine which dates around 1920 and is in the Art Deco style. 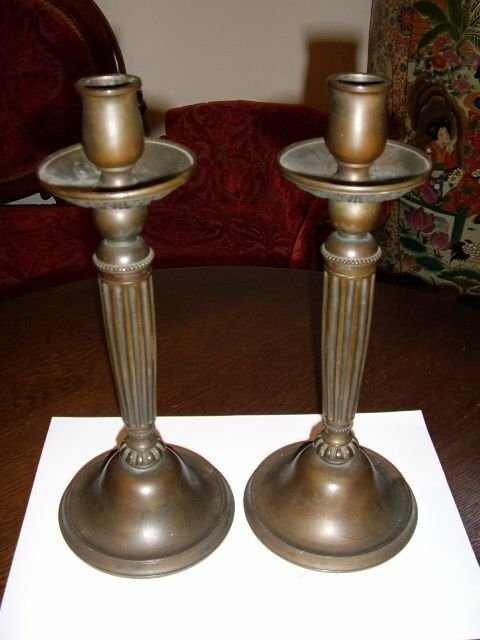 A fine example of a pair of early Bronze Candlesticks with canthus leaf design on the underside of the upper platforms. 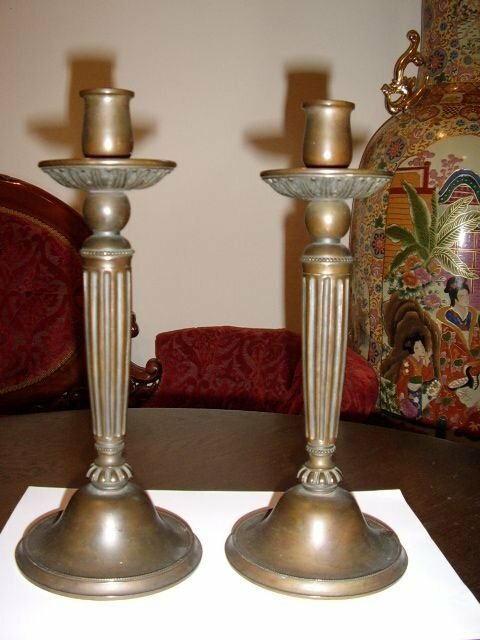 The main body of the sticks being decorated and finished with a plain base. 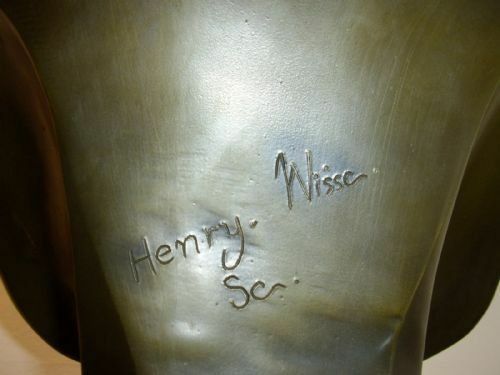 Measurements are 11 1/2 Inches in Height with a base Diameter of 5 Inches. 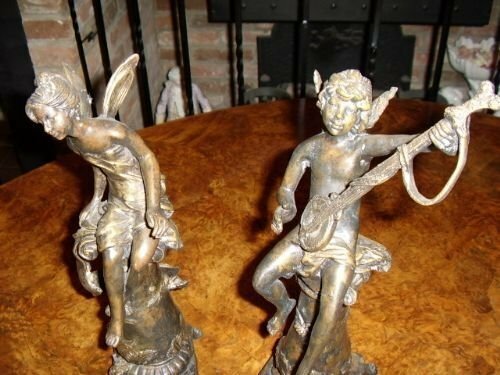 Both sticks are in excellent condition and still have their original patina throughout. 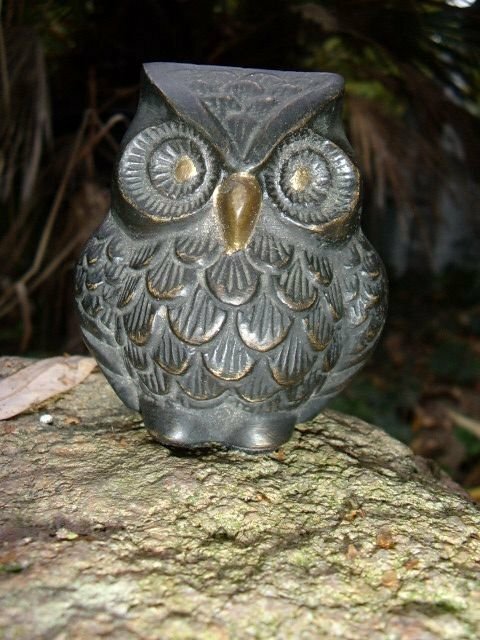 HOUR 10 AM - 10 PM 7 DAYS A WEEK. 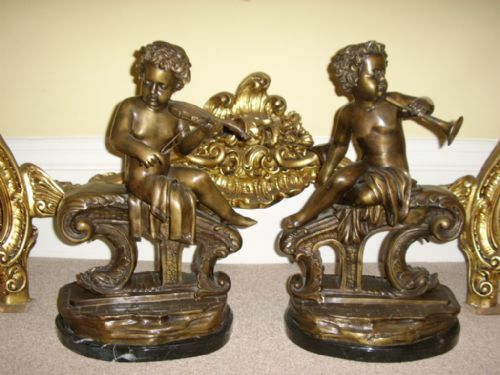 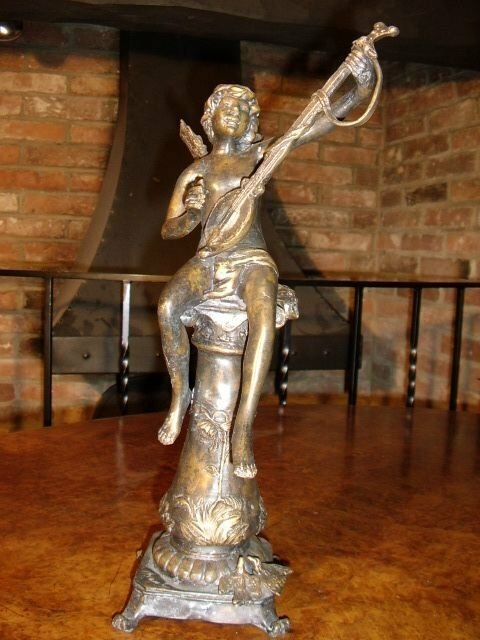 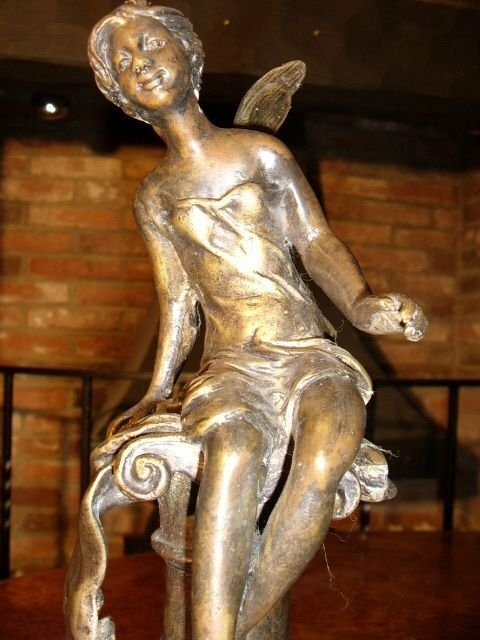 An interesting pair of cast bronze boy & girl angel figurines,in the art noveau style,sitting on ornate pillars as the boy plays a musical instrument to the girl. 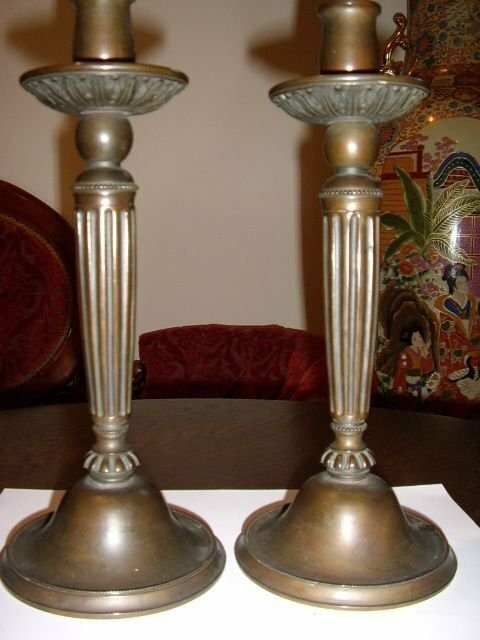 Nice dark colur and fair patina and have not been cleaned which is a benefit. 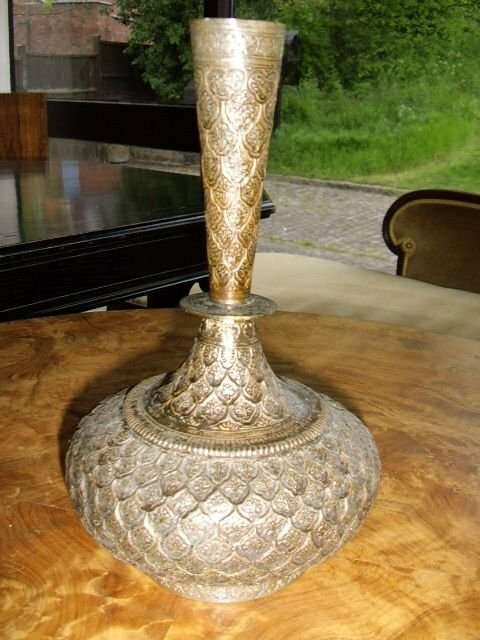 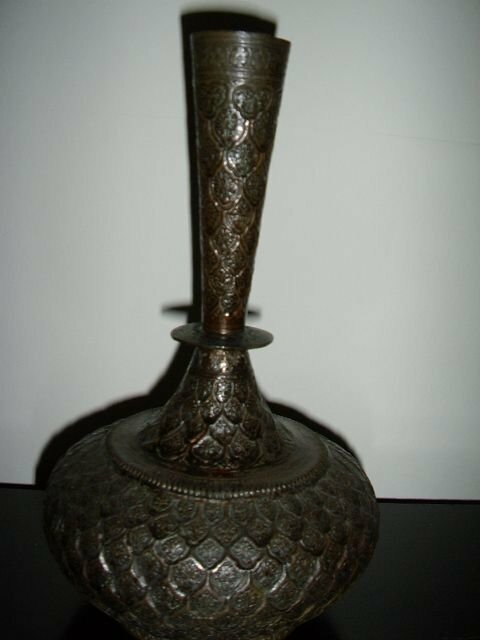 A very early hand crafted Bronze Tulip Vase which has been very cleverly and accurately tooled with decoration,which must have taken a considerable length of time to make. 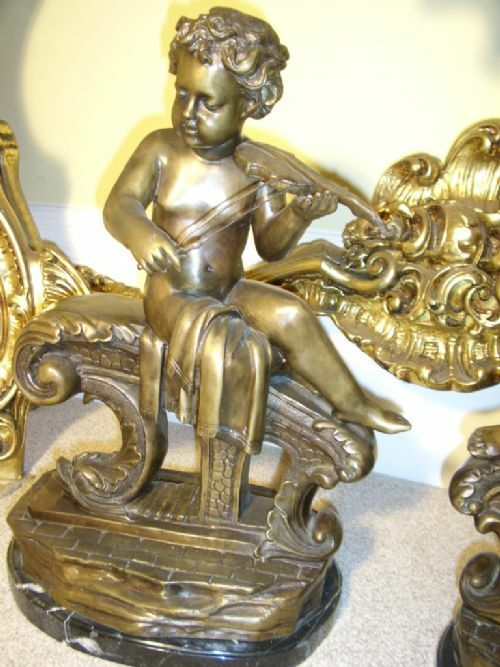 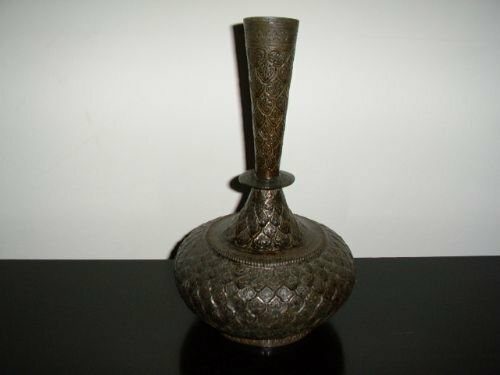 This item has a good bronze colour and patina and is in excellent condition for the age. 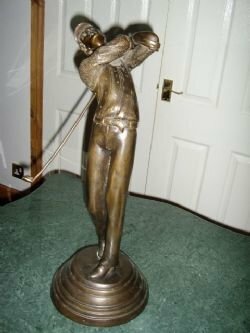 The origin of this item is unknown and so it could still be alot older than i have estimated. 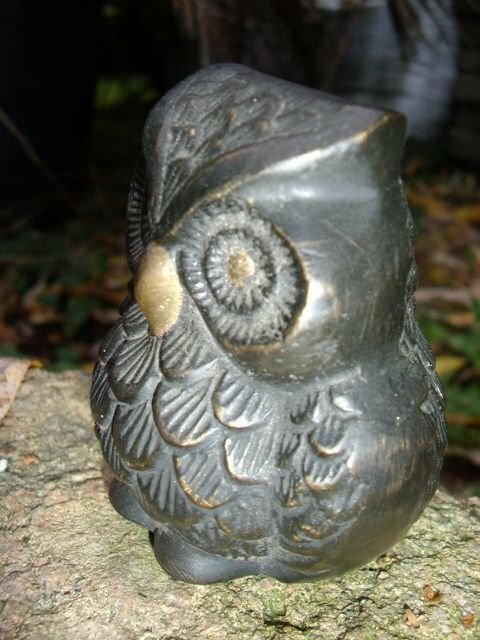 A lovely Bronze Owl Paperweight,well made with good detail in finishing and nice patina. 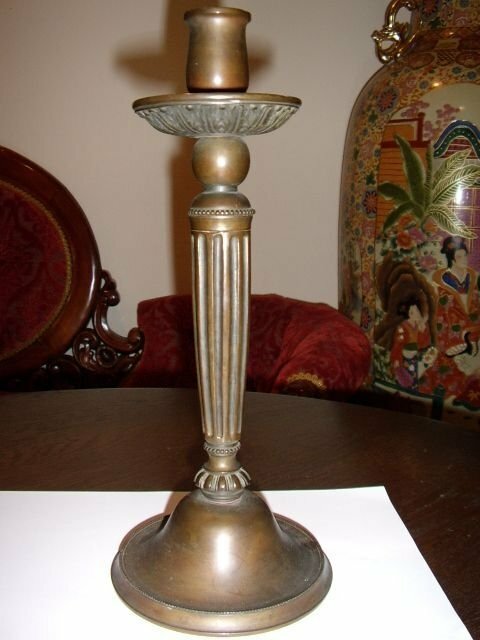 Condition is good with no damage or cleaning having been done. 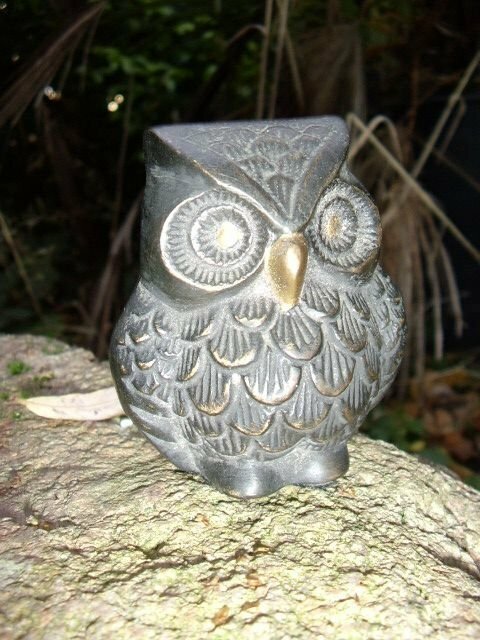 The Owl has a piece of black felt added underneath to prevent any scratches to surfaces.